In Unearth, players are in some sort of dystopian future – everyone is in a small tribe that is formed from the remnants of a great civilization. However, everything has gone wrong, and you are trying to reclaim the former glory of that previous civilization by discovering Ruins and collecting Stones. 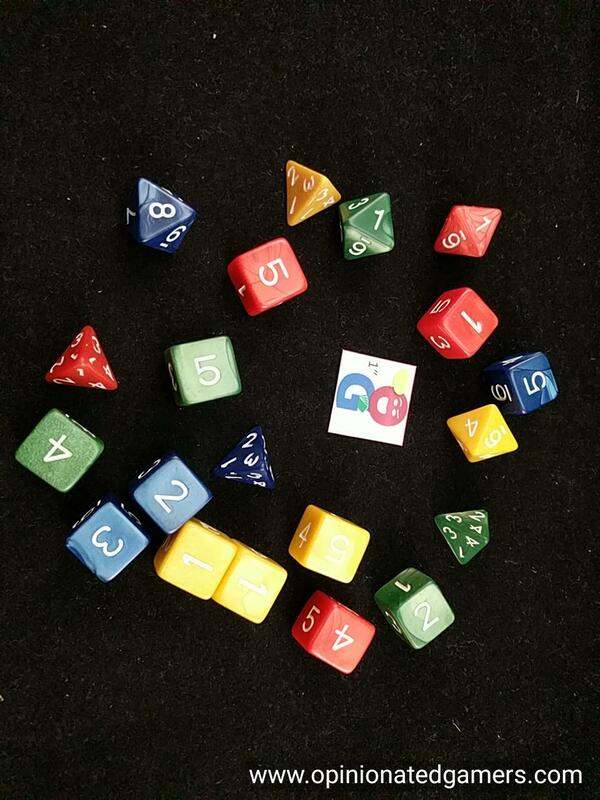 Each player has 5 dice which represent their Delvers – 3 d6, 1d4 and 1d8. There are three decks of cards used in the game – a large tarot sized deck of Ruins cards, a mini deck of Delver cards and a regular sized deck of Wonders cards. Each player takes the dice of his color as well as 2 random Delver cards and one Ruins card. 5 Ruins are discarded unseen from the deck and then a random End of Age card is put on the bottom of the deck. N+2 named Wonder cards are placed on the table and their matching tokens are placed on them. The rest of the Wonder cards are put back in the box. The Greater and Lesser Wonder tokens are shuffled and placed on the table. 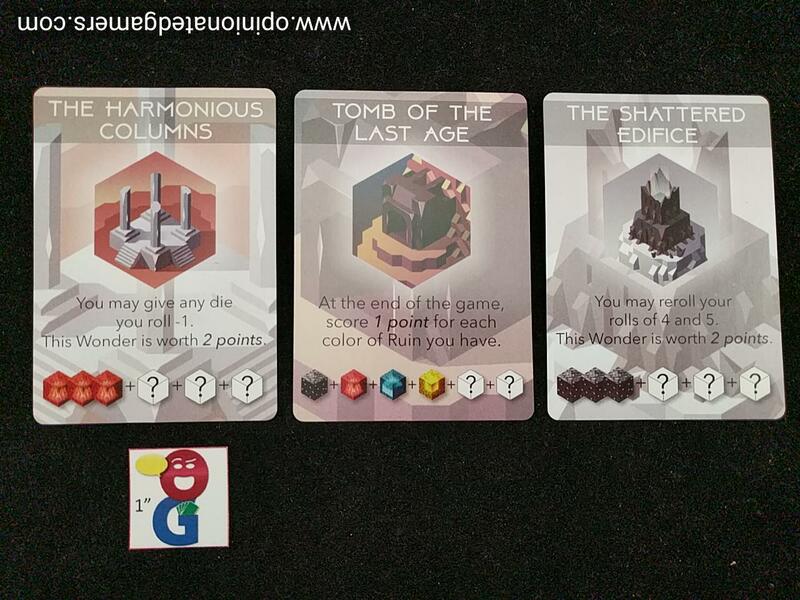 5 Ruins cards are placed on the table, and stones are drawn from the bag and placed on the Ruins according to the number in the hex on that card. On a round, the player goes thru two phases – first, he may play Delver cards; then he must Excavate. Excavate – you must roll one of the dice from your pool and place it on a Ruins card in the center of the table. Before you roll, you must clearly state which die you are rolling and which Ruin you intend to place on PRIOR to your roll. If you roll a 1,2 or 3, be sure to take a stone from your choice from the Ruin on which you are rolling on. If the ruin is empty, draw one at random from the bag. These stones are used to build wonders. Also, any time that you roll a die, check to see if a Ruin is claimed. If the total of all dice on a card is equal or higher than the number in the upper left of the Ruin card, the Ruin is claimed by the player with the highest individual die result on that card. Ties go to the die with more faces. If still tied, go to the second highest die of the tied players, etc. If the tie cannot be broken, no one wins the ruin card. Non-winners draw one Delver card from the deck for each die they had on that card. All dice are returned to their owners and all non-claimed stones are put back in the bag. A new Ruins card is placed on the table and Stones are seeded on it per the bottom right hex number. As you collect stones, you place them in front of you to form hexagonal shapes. Once you place a stone down, it cannot be moved. However, you can use stones for multiple wonders, so be sure to plan carefully when you start placing down your stone. When a hex is complete, you get place a Wonder tile in the center. If all the stones used to make a Wonder are the same color, you get a Greater Wonder token. If different colors are used, you get a Lesser Wonder token. Additionally, there were some named wonders placed on the table at the beginning of the game, they have a specific set up stones needed to collect it. There is a card that goes with each Named Wonder – and the owner of that wonder will get the card and whatever benefit is printed on the card. The game continues until the entire Ruin deck is revealed. Remember that the bottom card in the deck is a special End of Age card (chosen at random from 5 different cards). It is revealed like any other Ruin card. It is revealed, and it might be a new ruin or perhaps an event. 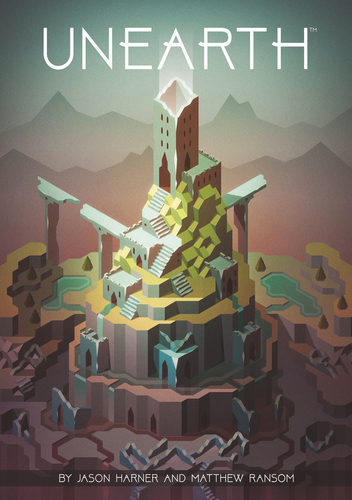 The game continues until all Ruins are claimed – then the game moves into the Scoring phase. 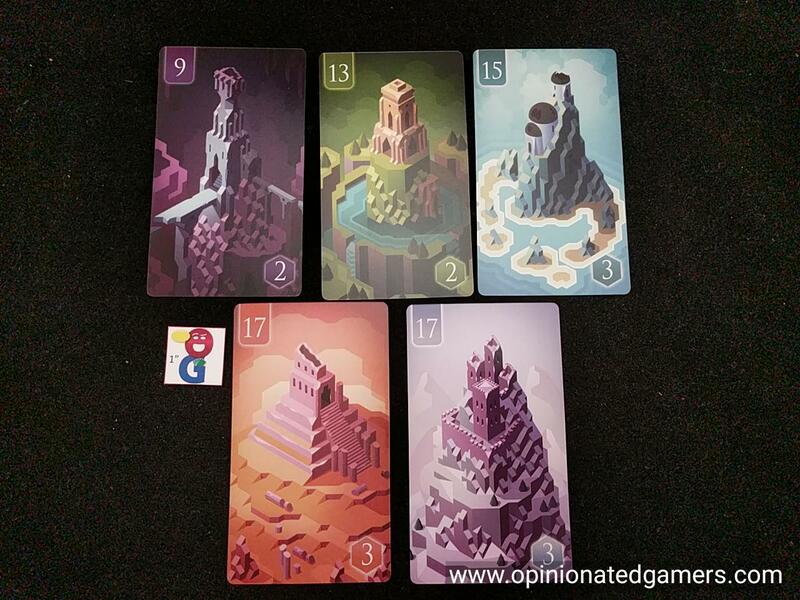 Players first score each color of ruins – gaining 2/6/12/20/30 points for 1/2/3/4/5 cards of that color. Additionally, you get 5 points for each set of five different color ruins. 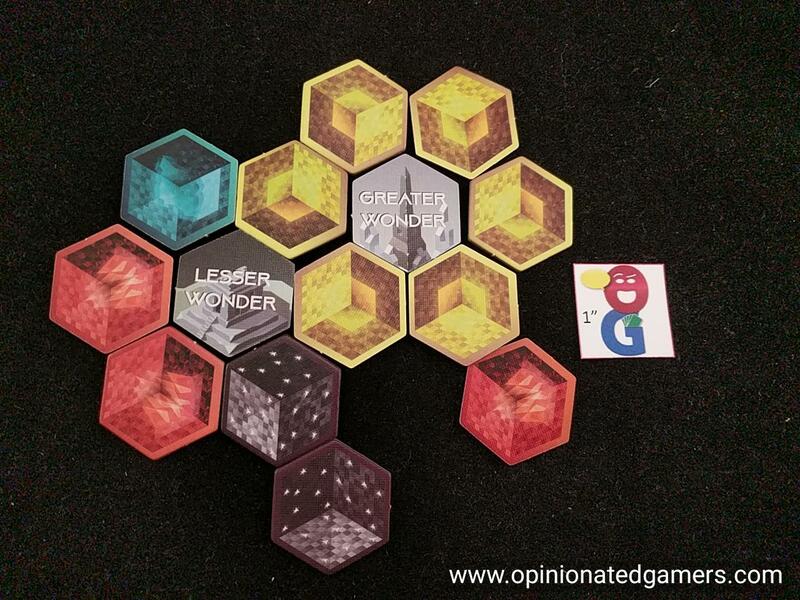 Then, each player score points as labeled on your Named, Greater and Lesser Wonders. Finally, you score a bonus of 5 points for building three or more Wonders in the game. The winner is the player with the most points. The tie goes to the player with the Ruin card with the highest value. The game has an interesting take on the dice placement genre; this is one of the few dice placement games that I can think of where you first choose where you’re putting the die, and then you roll it. Usually, you roll the dice first and then place them once you know what their value is. It’s really not a humongous change, you just have to look at the possible options and factor in the probabilities prior to deciding where you’re going to roll. The other nice feature of the game is the way that Unearth offers rewards for both low and high rolls. High rolls will definitely give you a better chance at winning Ruins cards, while lower rolls give you both stones to build Wonders as well as Delver cards which have some pretty powerful special abilities. I must make mention that so far in my first few games, that the high rolls have still felt more powerful as the scoring from the Ruins cards can be overwhelming if you’re able to get four or five Ruins of a single color. Of course, this could also just be some groupthink on our part in the way that we try to collect the Ruins cards (or avoid certain Ruins cards) or possibly weird dice luck. Timing is an important feature of a successful strategy. You generally can only roll dice available in your supply, so you’d like to make sure that your dice cycle quickly so that you have the most options available to you. This opportunity is mostly on the extreme dice (the d4 and d8). The d4 obviously likely gives you a low number which can provide stones to build wonders as well as hopefully providing you a steady stream of Delver cards. The d8 can be used to give you the best chance to swoop in and capture a Ruins card. 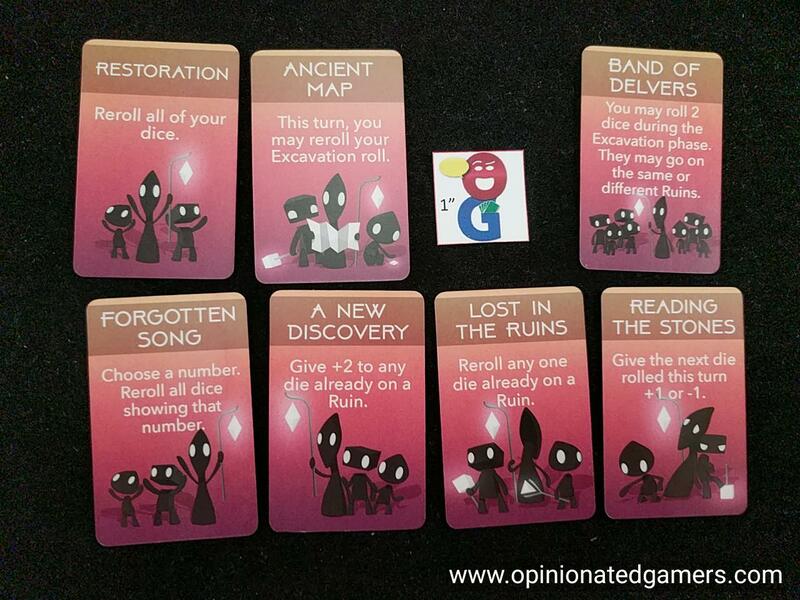 Usually, it’s better to try to win a Ruins card with as few dice as possible because if you win the card, you do not pick up Delver cards for your non-winning dice…. Some of the Delver cards can be huge – one allows you to re-roll all your dice – this can be a great way to pick up some Ruin cards or perhaps a bunch of Stones. 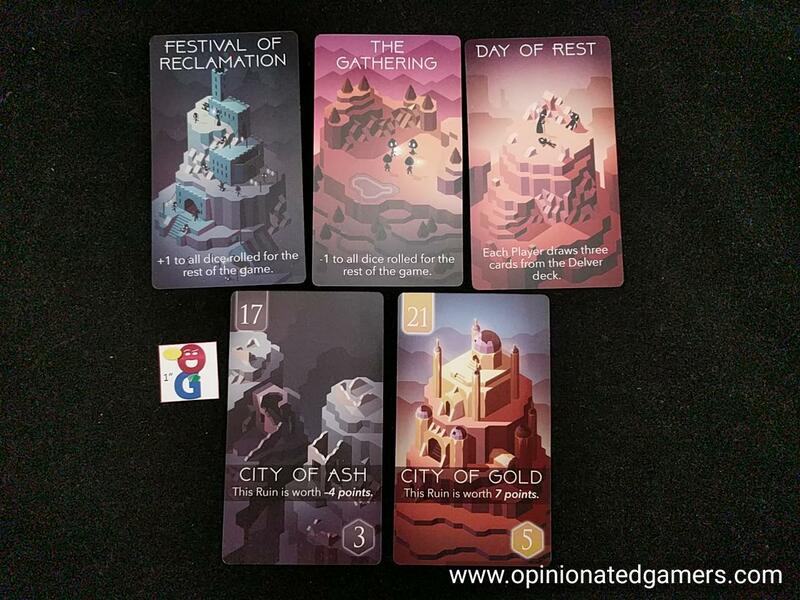 Second, as we are still learning the End of Age cards, there’s not really a lot of planning for them – it’s just a somewhat unexpected event that happens near the end of the game that we all deal with – it doesn’t really affect our overall strategy though. All that being said, it’s not a problem at all that the games feel the same. There’s nothing wrong with that (after all, no one ever complains about Carcassonne feeling the same every game), and the variable dice rolls give the game plenty of unpredictability and variability. My initial games have been quick, taking 45 minutes including rules. I have yet to play a game without a newbie, so I think that this would really be closer to a half an hour. The game is a beauty to look at, and thus far, the game play has been interesting, and I’m looking forward to further exploring it. Mark Jackson (1 play): This is a dice manipulation game with the interesting twist of forcing placement before knowing the result… and the varied paths to a win add to my interest. I can see some of the rough edges in the design – but that doesn’t keep me from wanting to play it again. About as interesting and random as snakes an ladders. Played once, couldn’t wait for it to end.